« Trump’s Golan Heights decision: It’s all about Iran, stupid! Prime Minister Benjamin Netanyahu welcomed on Saturday the imposition by Washington of new sanctions on Iran, announced a day prior. 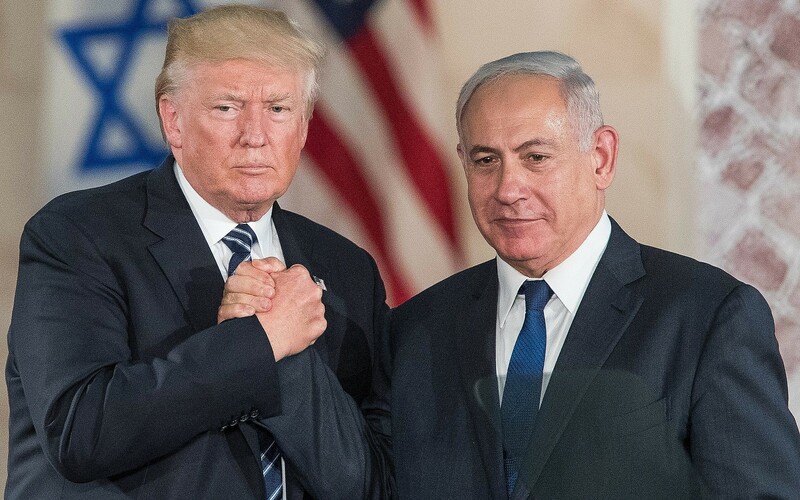 In a press statement, Netanyahu congratulated US President Donald Trump, Secretary of State Mike Pompeo and National Security Adviser John Bolton on the move, which imposes punitive measures on the heads of Iran’s military nuclear program. US officials said the decision to move ahead with the sanctions was in part based on Israel’s recovery of what it and the US call a “secret archive” of documents from Tehran, which they said shows that Iran deliberately preserved and stored its early nuclear weapons work, known as the “Amad plan,” with the intent to someday resume development of a bomb. “Iran continues to deceive the international community and lie to the world about its military nuclear program. The Iranian regime continues to conceal its capabilities and to strive for nuclear weapons. Iran endangers the peace of the Middle East and the entire world and must be blocked,” Netanyahu said Saturday. The US Treasury Department said the sanctions target 31 Iranian scientists, technicians and companies affiliated with Iran’s Organization for Defense Innovation and Research, which had been at the forefront of the country’s former nuclear weapons program. US officials said those targeted continue to work in Iran’s defense sector and form a core of experts who could reconstitute that program. Fourteen people, including the head of the organization, and 17 subsidiary operations are covered by the sanctions. The sanctions freeze any assets that those targeted may have in US jurisdictions and bar Americans from any transactions with them. But, US officials say the move will also make those targeted “radioactive internationally” by making people of any nationality who do business with them subject to US penalties under so-called secondary sanctions. US secondary sanctions apply to foreign businesses and individuals and can include fines, loss of presence in the American economy, asset freezes and travel bans. Officials said the threat of such sanctions will significantly limit the ability of those designated to travel outside of Iran, participate in research conferences or be hired for other jobs. “Individuals working for Iran’s proliferation-related programs — including scientists, procurement agents and technical experts — should be aware of the reputational and financial risk they expose themselves to by working for Iran’s nuclear program,” the State Department said in a statement. Instead, they were imposed because of their past work on nuclear weapons development and the potential that they would be at the forefront of any Iranian attempt to restart that program. Iran pledged not to resume atomic weapons work under the 2015 nuclear deal and the UN’s atomic watchdog says Iran continues to comply with the agreement. The US pulled out of the agreement last year, saying it was fatally flawed and allowed Iran to gradually begin advanced atomic work over time. The Trump administration has re-imposed US sanctions that were eased under the terms of the deal and is continuing to impose new ones as part a pressure campaign to force Iran to renegotiate the agreement. This entry was posted on March 24, 2019 at 1:35 PM and is filed under Uncategorized. You can subscribe via RSS 2.0 feed to this post's comments. You can skip to the end and leave a response. Pinging is currently not allowed.